O, ce trist, ce înalt era Crist ! - De unde vii, Doamne? Din ce veac? - Pune-Mi pe răni mâna ta! Mi-apar și azi în minte. Și numai scrum din stele. The Martyr soldiers are a special category of saints in the Christian Tradition of the first centuries. Together with the more famous St. George, St. Demetrius or St. Theodor Stratilates, Saint Mercurius is considered as being a model of a Roman soldier who became a soldier of Christ against the polytheism. There are many accounts about the life of Saint Mercurius, from which there may be mentioned the Saint Mercurius’ Passion under Decius, a Greek text to be found in the vitae collection of the bollandist Hippolyte Delehaye, under the number BHG (Bibliotheca Hagiographica Graeca) 1274. A short version of his Passions is attributed to Acacius of Caesarea, who wrote a Panegyric about in the 4th century. To these it may be added the Coptic tradition about the early life of the saint. This variant starts as follows: St. Mercurius was born in 225 in a pagan military family from Eskentos (Cappadocia, Asia Minor), his original name, Philopater meaning „lover of the Father”. His father was a Scythian officer in the Roman army, named Yares, or, after another sources, Gordian. The conversion of the family happened after his father was miraculously saved from death, during a campaign of hunting, by an angel of the Lord. All of them were baptized and reached the names of Noah (formerly, Gordian), Saphina (his mother), respectively Mercurius (former, Philopater). Their life continued after the Christian teachings. Later Mercurius replaced his father in the military position, apparently being 20 years old, joining the Roman army and gaining a reputation as a great swordsman and tactician, fighting in Armenia in the cohort of Martenses (of Mars, the ancient Roman god of the war), under the command of Saturninus. The Greek Passion starts with the moment when, apparently not being anymore in Cappadocia, but near Rome, Mercurius participated to a fight against some barbarians who attacked the capital city, together with Emperor Decius (249-251). After several days of fighting, the Archangel Michael appeared to Mercurius holding a shining sword, and telling him: „Mercurius, servant of Jesus Christ, don't be afraid. Take this sword from my hand and fight the barbarian with it. Don't forget your God when you come back victoriously. I am Michael the Archangel, whom God sent to inform you that you should suffer for the Lord's name. I shall be with you and support you until you complete your testimony. The name of our Lord Jesus Christ will be glorified in you”. There must be mentioned that Mercurius didn’t understand at the moment who was the person who helped him. An extended text of the Passion, used in the Orthodox synaxaries attests that Mercurius was scared and thought that the person may be one of the noblemen from Rome. The saint took the sword from the archangel and fought against the barbarians in such a manner that killed many of them. Because of bearing two swords, one of his own and another one received from St. Michael, Mercurius bears in the Arabic world the name Abi-Seifein - "the holder [literally, father] of two swords”. When Decius heard the news about the triumphant victory, he appointed Mercurius as general and let the soldiers to take a breath into the city. In the same night, the angel woke him up and told him who he was. He also prophesized about his martyrical future: „See, do not forget the Lord your God. For you must compete in the customary manner on his behalf and gain the crown of victory in the heavenly kingdom together with all the saints”. In that moment Mercurius remembered about the God of his father and the way his father used to pray, and promised to confess the Lord in front of all. In the second day, Decius wanted to thank to his gods for the victory and sent someone to call Mercurius to a council. The council decided to make a sacrifice at the temple of Artemis, but Mercurius was absent, invoicing illness. In the day of the sacrifice, Mercurius slipped into the crowd and avoided once to sacrifice. Anyway he couldn’t avoid the next meeting with the emperor who claimed to have heared some informations that he doesn’t want to sacrifice. At that moment, Mercurius confessed who was the real helper in the war, namely the only God, Jesus Christ, and told to all of them, that he was a Christian. Because of that he was degraded from his military position and dishonored. Decius sent him into the prison until the moment of the punishment, but here Mercurius was once more encouraged by an angel. According to this Greek Passion, Mercurius told the emperor that his father’s name was a Scythian called Gordianus, and that his real name is Philopater. He received the name of Mercurius only after the tribune in the army called him like that. He said that he is not afraid for torture, because he has “the breastplate and shield of faith through which I will conquer every scheme wrought against me”. Because of these words, Decius decided to benailed by his arms and legs over a fire, but his blood extinguished the fire and, back in prison, he was miraculously healed by an angel and further encouraged. In the next day, seeing him healthy, Decius accused him of witchcraft and ordered to his soldiers to hang Mercurius upside down with a stone along his neck. He was beaten with fourply cords and burnt with a red-hot iron. Finally Decius ordered that Mercurius must die by beheading in his land (Cappadocia) as an example to others. In Cappadocia the Lord Himself appeared to him and called him to the eternal resting, giving to him the crown of the martyrdom. He was beheaded on November 25. In Acta Sanctorum of November (which published the version of Synaxarium Ecclesiae Constantinopolitanae) there is described that he was 25 years old, (ετών κε᾽), with lofty stature (ευήλιξ), handsome (ωραίος), rosy face (τω είδει ροδινός), blondhaired (τη οράσει ξανθόκομος). But he preferred to sacrifice himself for Christ. Then, after he was blessed, Mercurius was so happy that he ran to his executioners, begging them to carry out the king's orders immediately. Then he knelt down and said, "Lord, do not count this sin against them." Mercurius was beheaded on 4 December 250. 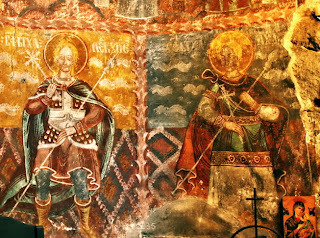 The relics of the saint supposedly remained in Cappadocia, in a church. But the cult of the saint started to increase rapidly in Egypt, where there are many churches dedicated to him, including the one in Qasr al-Sham in Old Cairo, dating from the 6th century. An Armenian Catholicos visited Egypt during the patriarchate of Jon XIII (1484-1524) and brought part of the relics of Saint Mercurius, in order to be placed in the church already mentioned. This moment is celebrated in the Coptic calendar on 9 Baounah (16 June). Some other relics are spread in other churches, such as Monte Vergine in Campania and church of San Mercurio a Serracapriola, near Foggia, both in Italy. Another relic is reported to be hosted in the monastery of Vatopedi and also in about 10 other monasteries in Athos and the same number in Greece. According to the tradition, the relic of the head of St. Mercurius is in the Cathedral in Râmnicu Vâlcea (Romania) since 1767. Another relic may be found in the monastery of Horezu, about 100 km near Râmnicu Vâlcea and in the Church of St. Mercurius in Bucharest. 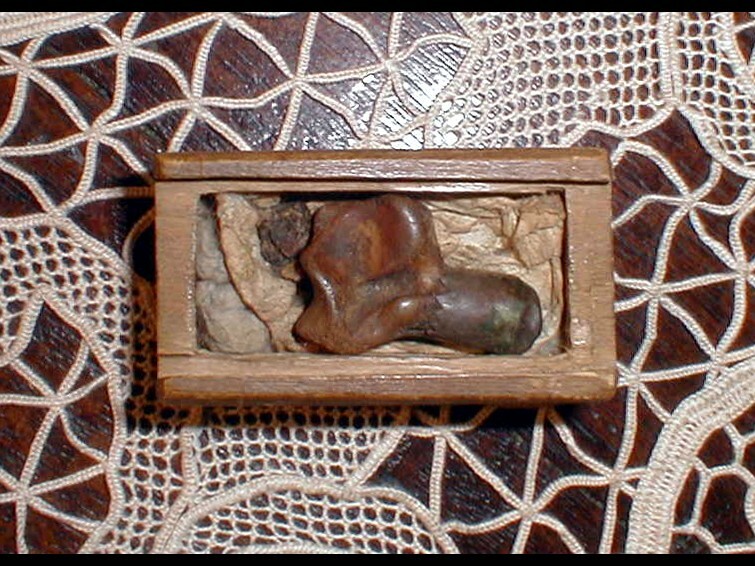 The Egyptian Church possesses many small pieces of his relics in many temples especially in Cairo, Giza and Alexandria> such as the St. Mercurius church in Old Cairo, also in the Coptic church in Frankfurt and in the Coptic monastery of Kröffelbach, both in Germany. 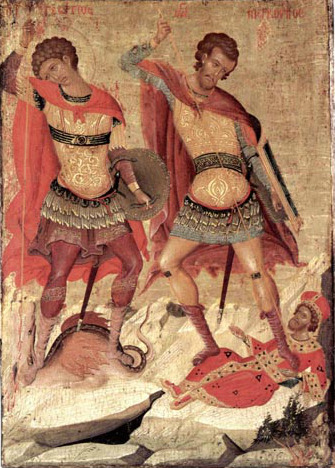 St. Mercurius killing Julian the Apostate. 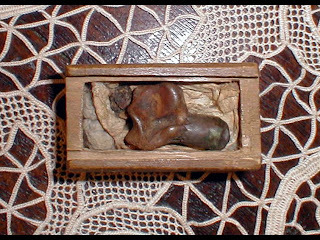 The miracles with his body started directly after his death. He became white like a snow and emitted a sweet smell of myrrh and incense. He was buried in the place where he died and the later vitae attest a lot of miracles about him. From these, we will mention a story from The Life of Basil by Amphilochius of Iconium (9th century, Bibliotheca Hagiographica Graeca 247) and from the Chronicle of John Malalals (5th century). St. Basil of Caesarea was praying about 100 years later for the Christians to be protected from the hands of the pagan emperor Julian the Apostate (361-363). He had two icons towards him, namely one of the Virgin Mary and another of St. Mercurius. At that time Julian was engaged into a war against the Persians. In the very moment of the prayer, the spear of St. Mercurius appeared as blooded, and there is reported that Julian died in the very moment, being killed by an unknown soldier with a spear. Anyway the story differs from the official one, according to which Julian died because of an arrow. 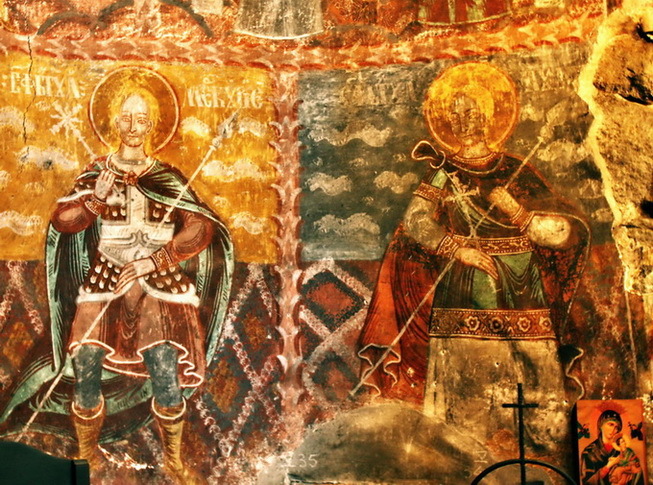 The story is depicted especially in the Coptic icons of the saint, where he appears with his two swords and killing with a spear the emperor Julian, during St. Basil, in the background, is praying. According to two Syriac sources, The Romance of Julian the Apostate and The Life of Eusebius of Samosata (Bibliotheca Hagiographica Orientalis 294), the executioner of Julian was Mar Qurus, one of the forty martyrs of Sebaste. This identification made some researches to think that the story of St. Mercurius under Decius may be apocryphal. St. Mercurius is celebrated in the Western Church on 11 November, and in the Eastern on 24 November (7 December, after the Gregorian calendar), which corresponds in the Coptic Calendar with 25 Hathor (4 December). Additionally the Coptic Church celebrates him on 9 Baounah (16 June), the date of moving of the relics and on 25 Abib (1 August) when celebrates the commemoration of the consecration of the first church named after the great St. Mercurius Abi Saifain. There is also to be mentioned that in the eve of his commemoration of 9 Baounah (that being 15. June) 2007, there were registered about one million pilgrims at the Coptic Monastery Abi Seifein in Cairo. Your holy martyr Mercurius, O Lord, through his sufferings has received an incorruptible crown from you, our God. For having your strength, he laid low his adversaries and shattered the powerless boldness of demons. Through his intercessions, save our souls! 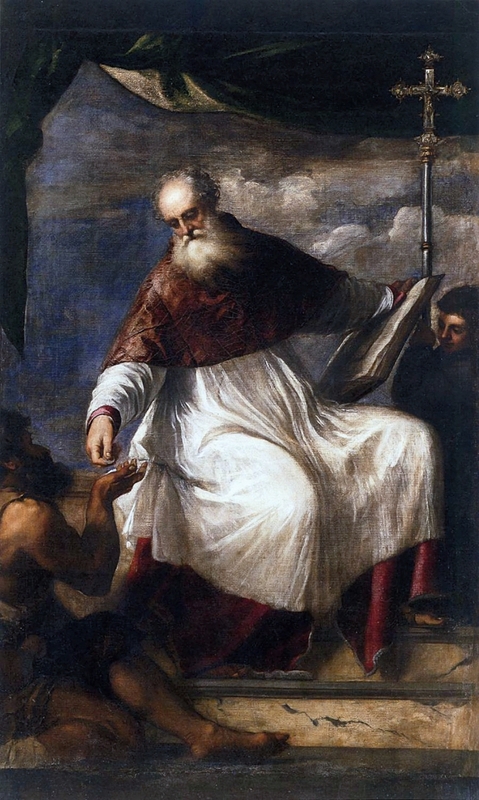 Saint John the Merciful (also known as John the Almsgiver, John the Almoner, John V of Alexandria, John Eleymon, and Johannes Eleemon), was a patriarch of Alexandria about 100 years after the Chalcedonian split in Egypt (610-616 or 619).He is one of the most known saints who practiced incessantly the virtue of generosity among the poor but not only. Today he is celebrated as saint not only in the Orthodox and Catholic Churches, but also in the Coptic and Ethiopian- Eastern Orthodox Churches -, as well. The life of Saint John the Merciful was written by St. Leontius, bishop of Neapolis in Cyprus, who is also the author of the first biography of a saint fool, namely St. Symeon of Emesa, the Fool for Christ’s sake. The text about St. John is to be found beginning with col. 1623 in Migne’s Patrologia Graeca, volume 90, with the title “Vita Sancti Joannis Eleemosynarii” and also in Acta Sanctorum, t. II (January), p. 501ff. According to Leontius, Saint John came from Cyprus, from a town named Amathus, being born c. 550 AD, as the son of Epiphanius, a patrician and the governor of the island. John was raised as a true Christian from childhood. The biographer accentuates that he married almost forced by his parents and had children. But soon his wife died and his children too, so that John remained alone, practicing the virtue of almsgiving. On the recommendation of a friend, the imperial prefect of the capital city of Cyprus, called Nicetas, he was elected on the free seat of Alexandria. At his time, 100 years after the 4th ecumenical Council of Chalcedon (451), the Church in Egypt was split between the adepts of the local policy (called later „coptic”) and the „partisans” of the imperial policy. The doctrine about the one of the two natures in Christ was strongly instrumentalized in both directions, so that the majority of Egyptians did not accepted the Chalcedonian dogma rather from political reasons. The Orthodox were named in Egypt as „melkites”, that is, the partisans of the emperor, and despised for their faith which was “the faith of the emperor”. Saint John came in Alexandria on the not so popular „melkite” see, vacant since the death in 609 of Theodore, during the capture of the city by Nicetas. In 611 John assumed the throne, becoming the fifth Chalcedonian bishop of Alexandria to bear that name. Even unpopular, the Patriarchate possessed a great wealth in money and commercial (especially shipping) enterprises. In his youth John had had a vision of a beautiful maiden with a garland of olives on her head, who said that she was the Compassion, the eldest daughter of the Great King (=God). This had evidently made a deep impression on John's mind, and, now that he had the opportunity of exercising benevolence on a large scale, he soon became widely known all over the East for his liberality towards the poor. Even from the beginning of his service he repeated, that „If you desire nobility, seek it not in blood but in virtues, for this is true nobility”. Also at the beginning of his services, he has sent his accountants on the streets of the city with the mission to make a list with his „lords”, these being the poor people. The list cuprindea 7500 names and these persons received every day food and other help from the Church’s income. Of course, this attitude has brought a reaction: too many people were searching for the help of the patriarch, so that he decided to remain always on Wednesday and Friday towards the doors of a church and to listen the problems, even sometimes he was judging cases of injustice. In the days nobody came, he was sad and used to say that the humble John hasn’t gain anything and hasn’t brought anything to God, for his sins. Saint John was not only liberal with the resources of his see, but with his own goods. In one incident in his life he felt remorseful for accepting a richly-embroidered blanket as a gift and was unable to sleep until he sold it and gave the proceeds to the poor. Once, while celebrating the Holy Liturgy, the patriarch remembered the words of Christ, „Therefore if you bring your gift to the altar, and there remember that your brother has something against you, then leave there your gift before the altar, and go your way; first be reconciled to your brother, and then come and offer your gift (Matthew 5:23-24). In that moment he went to a clergyman who had something against him, leaving the service opened, fell before the priest’s feet and begged for forgiveness. After he had made peace with this man did he return to the altar and continued the Liturgy. Another famous story about the patriarch is that he was once on his way to the Church of Saints Cyrus and he met a needy widow who spoke to him at length about her misfortune. The escorts became bored by the lengthy complaint, and urged the bishop to hurry to the church for the service, saying that he could hear the woman's story afterward. But John replied that: „And how will God listen to me, if I do not listen to her?” So he remained and heard the widow's complaint to the end. His generosity did draw censure at times. Once a servant of him noticed that someone was abusing the distribution of goods in John's very presence, returning several times in different guises, but John replied that it might be Christ in disguise. Also when there was reported, that among the poor there are also wealthy people receiving alms, John said that Christ may hide under any appearances. The care for the sick and the enslaved was also among his daily missions. He visited the hospitals three times every week, and he freed a many slaves, by offering money to the one who captured them. The political situation of the Byzantine Empire at the moment wasn’t quite well. The Persian War affected the eastern regions, including Palestine, Syria and Asia Minor. In this situation, John came into a conflict with his friend Nicetas, who was concerned to contribute to Emperor Heraclius’ war effort against the Persians. John firmly resisted and didn’t want to offer from the church’s wealth, which was in his vision the sole property of the poor. Finally Nicetas apologized himself and the Church wasn’t forced to contribute to the war. That doesn’t mean John didn’t care about the fate of the empire, but he tried to help the people who needed supplies. When the Sassanid Persians attacked strongly, St. John extended his mercy to the people of Palestine and Jerusalem (614). He sent convoys of essential supplies to Palestine and welcomed many refugees to Alexandria. John usually refused the controversial discussions. In the patriarchal palace accepted only commentaries on the Scriptures or other spiritual topics. He hosted sometimes learned theologians such as St. Sophronius, future patriarch of Jerusalem, and John Moschus, the author of the Leimonarion (Spiritual Meadow), but in spite of his strongly orthodox position, he was an example of religious tolerance during the Christological disputes. He refused to accept the violence in order to impose the Chalcedonian Orthodoxy. It is true that he used the theological ability of men such as Sophronius and John Moschus to defend the „imperial” position, but that was all. 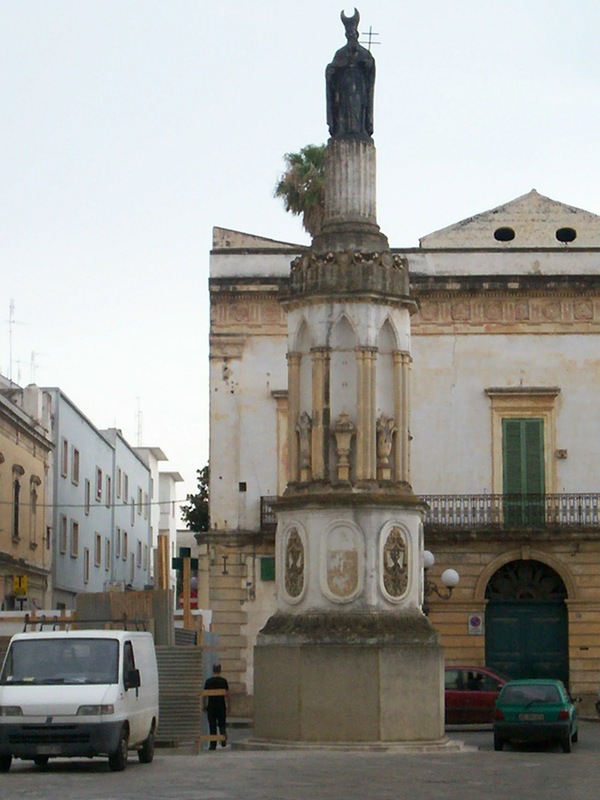 As a result of his efforts the number of Chalcedonian churches in the city increased ten-fold during his reign, according to his Life. The religious disputes were also political ones, so the emperors urged to find a compromise against the dissolution of the empire. So, in order to reach reconciliation between the Chalcedonians, who defended the two natures in Christ and the non-Chalcedonians, who defended the one nature, Emperor Heraclius (610-641) imposed a mixed formula, known in the history as „monoenergism” or later as „monothelism”. According to this position, there was defended the Orthodox position of two natures in Christ, but there was affirmed the existence of a single work (mono-erga) and a single will (mono-thelos) in Christ, which in fact was a disguised unorthodox formula, because the human nature would have been practically inactive in the Person of Christ. Saint John was forced to flee Alexandria by the Persian invasion of Egypt in 619, or, after the Western sources, in 616. HeJohn boarded a boat to escape from danger, but along the way he fell ill and, arrived in Cyprus, he reposed at his birthplace, in 620 (or 616). A few years later much of John’s work of reconciliation with the non-Chalcedonians of Egypt was undone by the violent persecution instituted by Cyrus (631–641), who combined both imperial and ecclesiastical authority as dual prefect and patriarch of Alexandria. During his reign, the Muslims invaded Egypt, who never came back under the Christian rule. The celebration of St. John the Merciful occurs in the Orthodox Churches on 12 November (26 November in the Churches who respect the old calendar) , although he might have died on 11 November, when he is celebrated in the West. Another day of celebration is 23 January. 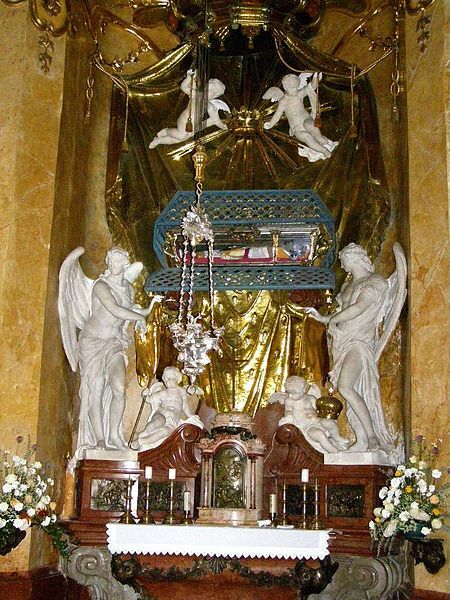 The relics of Saint John were soon reported to be wonderworker. There were soon moved to Constantinople, then in 1249, during the 4th Crusade, to Venice. There is a church dedicated to him in Venice, the Church of San Giovanni Elemosinario, but his relics are preserved in another church, San Giovanni in Bragora, in a separate chapel. 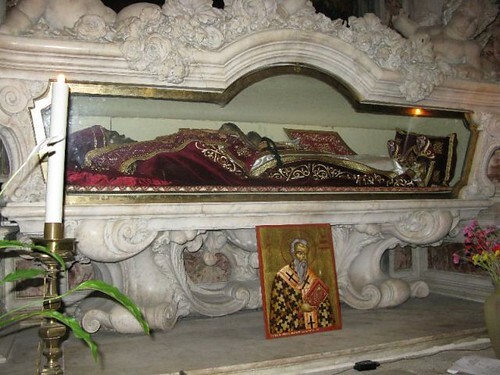 Apparently a part of the relics remained after the 4th Crusade further in Constantinople, because there is reported that another relic of St. John was sent by Sultan Bayezid II in 1489 to King Matthias Corvinus of Hungary. It was placed in the private Royal Chapel in Buda Castle, dedicated to St. John. Now these relics are to be found in the St. John the Merciful Chapel, at the St. Martin's Cathedral in Bratislava, Slovakia. Some other relics are to be found in some monastery in Athos, as Dionisiou (his right hand), Vatopedi, Pantokrator, Dochiariou and Karakallou. Saint John the Merciful is the Patron saint of the town Casarano, in southern Italy and the original patron saint of the monastic order of the Hospitallers. By endurance you gained your reward, venerable Father; you persevered in prayer unceasingly; you loved the poor and provided for them in all things. Blessed John the Merciful, intercede with Christ God that our souls may be saved! La subsol. Celula Nr. 5, lungime 2 metri, lățime 1 metru. Deasupra ușii, o gaură pentru aerisire și lumină. Bolnav de icter. Medicament - fără pâine și ciorbă - și niște calmante. Banca pe care dormeam nu are saltea. După 75 de zile, doctorul îmi spune că m-am vindecat. Sunt dus la anchetă. Își bat joc de mine, că sunt prost și nebun. La plecare mă întreabă: ”Ce relații ai avut în București, pe strada…?” Nu-mi aduc aminte. ”Du-te în celulă și acolo ai să putrezești!” Nu mă lăsau să dorm. Băteau mereu în uși. Când mi-am adus aminte de stradă, am leșinat. Era adresa familiilor Codreanu și Moța. Turnătorul era din grup cu noi. Nearestat. Pe 21 aprilie, în zori, visez un vis ciudat: Prin gaura de aerisire, două bețe de corn lucioase, fără noduri. S-a luminat celula. O voce mi-a spus: ”Pune mâna pe ele!” Am sărit de pe bancă. Zic: ”Acum o să mor. Mă cheamă la ei!” Erau martirii căzuți în luptă, în Spania. Și cu o voce puternică, încep să cânt ”Ștefan al Moldovei”. Ușa se deschide. Erau cinci gardieni speriați: ”Ce ai cântat?” Recit ”Mama” de Coșbuc. Astăzi Comisia juridică îmi spune: ”Procesul tău… ori acasă, sau la tribunal”. A doua zi plec la Aiud. În tren am auzit că e Săptămâna Mare și Duminică e Învierea. Acest proces s-a judecat în iulie 1958. Condamnat la 22 ani. Eliberat pe 22 iunie 1964, cu decretul.